You may have noticed my beautiful flag that I designed a few years back. That would be the rebel side of my personality shining through. The design blossomed in my mind during the recent dark days in Canadian politics a few years back. An oppressive, Eastern based politic regime kept our country suppressed and hobbled; fiscally, militarily and politically. Personal freedoms were being erased and the voices on the average person were not being heard. From this I designed a flag that reflected the rebel spirit. I hope you like it, as much as I do. Some have asked where I was inspired to this design?? 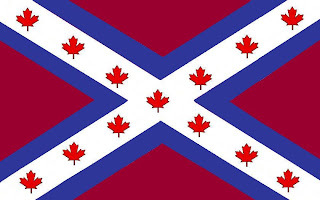 My Rebel Canadian flag is based from the Saltire or St. Andrew's Cross, the flag of Scotland, and those brave explores and adventurers who explored, mapped and connected Canada from coast-to-coast-to-coast. These same brave people were also the ones who made peace with the First Nation's peoples who occupied Canada before the wave of Europeans arrived. It was the common warrior society structures of the Highland Clan and Native Tribes, that allowed these first encounters to bridge the gap of the unknown. The thirteen maple leaf's symbolize the ten provinces and three territories that make up Canada. The blood red triangles symbolize the blood that has been shed to defend our nation and to defend freedom around the world. This is a flag that symbolizes being a Rebel to status quo and a resister to the Global Cabal, the Global Elites and the enslavement of Planet Earth. To the unity of Canada, this flag also has the red, white and blue of the two countries that fought to explore, exploit and claim this country as their own - England (Union Jack) and France (Tricolour).